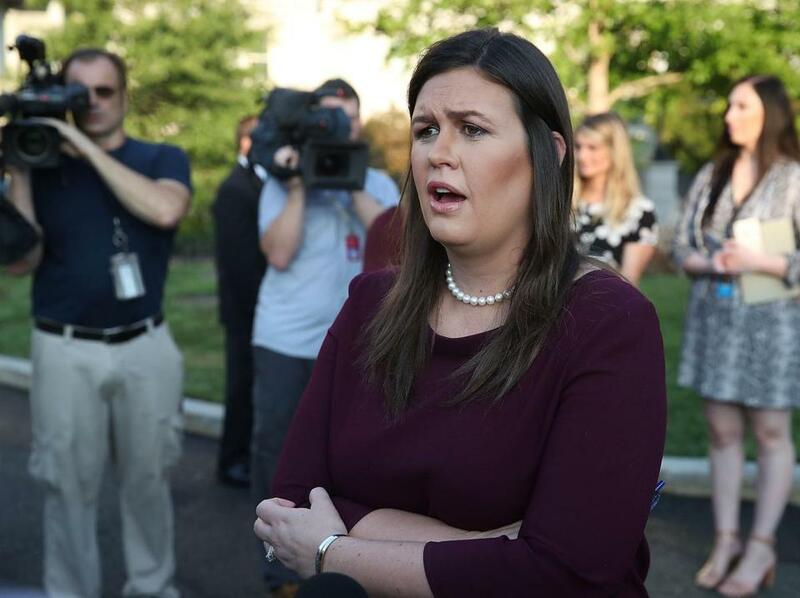 White House Press Secretary Sarah Huckabee Sanders spoke to the media Wednesday morning. Some of the top women in the White House are blasting an anonymous New York Times op-ed in which the author, identified as a senior Trump administration official, claimed that officials are working to undermine the president. First lady Melania Trump reportedly bashed the anonymity of the writer in a statement to a CNN reporter. White House press secretary Sarah Huckabee Sanders tweeted a statement on Thursday telling people who are asking about the identity of the writer to “stop.” She then encouraged those who are curious to “call the opinion desk of the failing NYT,” and then proceeded to give out the phone number for the publication. White House counselor Kellyanne Conway, for her part, seemed more flippant during an interview with Laura Ingraham on Fox News on Wednesday night. “It really depends who it is. I also think that’s not particularly relevant, meaning like, who it is,” Conway said. “That’s a problem,” Ingraham said. “That would be a huge problem,” Conway agreed. She then veered off to start speaking about Trump winning the 2016 election and his policy wins. US Representative Mark Meadows of North Carolina, a congressional ally of Trump’s, said he thinks the issue is ‘‘serious from a national security standpoint.’’ Meadows is the chairman of a House subcommittee that oversees the president’s executive office and a founder of conservative Freedom Caucus. Meadows said he disagrees with Ryan, who said earlier in the day that he doesn’t know what role Congress would have in investigating the opinion piece. Meanwhile, several other administration officials — including Mike Pence, Ben Carson, Jim Mattis, Mike Pompeo, and Dan Coats — have denied that they wrote the op-ed. Trump railed against the op-ed during a meeting of dozens of sheriffs from across the country on Wednesday, calling the anonymous piece “gutless.” He also tweeted about it shortly after. Does the so-called ?Senior Administration Official? really exist, or is it just the Failing New York Times with another phony source? If the GUTLESS anonymous person does indeed exist, the Times must, for National Security purposes, turn him/her over to government at once!